Find free classifieds for Land for sale for sale or to buy in Andhra Pradesh. FREEADS in India offers you a platform to post free advertisements or classifieds for Land for sale, Andhra Pradesh. FREEADS in India helps you search, find, buy, sell, rent or hire in various categories like apartments, goods for sale, local services, cars , jobs and many more in Andhra Pradesh. 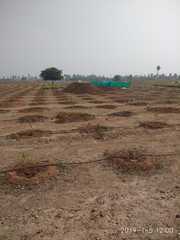 Shown below are ads available in Land for sale, Andhra Pradesh. You can use search box above to refine your search. 240 Sq. Yards West Facing Plot in Bhaskar Nagar, Opp. CTRI, Behind Anjaneya swami temple 6th Road Plot Measurements 30 * 72 = 240 Sq. Yards Ready for immediate construction. * DTCP Approved Layout * 40 and 33 Feet Roads * Impressive entrance in a pleasant environment * Fruit Plantation * Sewage Line * Over Head Electricity Lines * Customer Name Boards for every plot * Blacktop Roads for entire Layout * Park Developments LOCATION ADVANTAGES * 1 Km to Korukonda Bus Stand and Center * Ready for immediate House Construction. గాడాల DTCP ప్లాట్స్ - చదరపు గజం కేవలం 8000/- Venture Developments * 60 and 40 Feet Roads * Black Top Roads * Open Drains * Electricity * Security Fencing * Entrance Security Gate * Clear Title with Spot Registration Location. At the top notch area Gannavaram, an amazing venture has been started by Sreshta housing projects Pvt Ltd. Harivillu is a luxurious residential project provided with world-class amenities. It is a CRDA approved layout with 100% Vaastu consistence. Gannavaram is found adjacent to the National Highway5 which interfaces Vijayawada and Eluru. Veenus Enclave is an independent real estate advisor with a pan-India presence. We possess vast experience and knowledge of real estate in India. If you are looking to buy Independent House or open plots In Hyderabad, then Veenus Enclave is the best option for you.we are Interested to sell independent house/villa and open plots. Investment in Vijayawada and its surroundings is always the best option. Among the many prominent places, Gannavaram will be in the top position to attract the investors. The key factors that made Gannavaram an excellent investment spot are the development of IT park Medha Towers, HCL technologies, airport, schools, colleges, recreation centers etc. Need to own a property in one of the quickly developing urban areas of Andhra Pradesh? At that point Vijayawada is the best alternative to make a venture. Sreshta Housing Projects Pvt Ltd is presenting a new project of well-laid plots near Gannavaram. It is located in the outskirts of Vijayawada with lovely climate and healthy neighborhood. Investing resources into land is always the best alternative to secure the money. These days numerous people are appearing at purchase plots instead of flats or houses. If you wish to purchase a plot and get great returns later on then it is better to do plantation instead of building a house. Sandalwood manor will be the best useful investment. Rachana group serves for plots for sale in Warangal. It value for their real estate investments in Residential Apartments and plots. HMDA Aproved PLOTS for SALES in KOTHUR, HYDERABAD, INDIA. 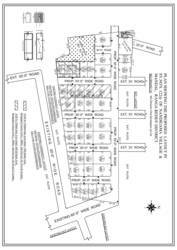 HMDA APPRVD PLOTS for SALES in KOTHUR, HYDERABAD, INDIA near DLF TOWNSHIP, KOTHUR Highway with loan facility. Close to P&G, Johnson & Jonshon, Amazon, Asain Paints, LV Prasad, Eye institute. Cost 14000 per sqyds. Call: 9397820459 https://www.facebook.com/dharaniinfradeveloperspvtltd/?modal=admin_todo_tour. Sri Gandham is one of the precious cash crop and unique which can yield lakhs and crores of rupees. Really there is no substitute for this tree. By noticing the gap between the supply and demand in Sandalwood production, an act was amended in 2001 to encourage cultivation of sandalwood in private lands. The Vijayawada Real Estate market has seen quick development in the recent period. There are numerous Residential Projects upcoming in the territory of Poranki, Kankipadu, Kesarapalli, Gannavaram, and Mangalagiri. The well developed wide roads and good environment increase the beauty of the city. Vijayawada is connected to the cities in the southern side through NH-9 and NH-5. Dont miss the chance to own a property in the new capital city of Andhra Pradesh. Harivillu is a prestigious project in Vijayawada, providing residential plots for sale at affordable prices. The project area is very close to the Gannavaram airport and is adjacent to the National Highway-5. The plots are provided with a wide range of amenities like a large compound wall, park, drainage systems, regular water supply, security, Vaastu compliance, green surroundings, blacktop roads, etc. 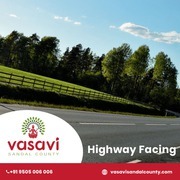 Find out the prestigious project on Hyderabad & Vijayawada highway. It is 99 acres of sandalwood plantation at Narkatpally, which is just 62km away from Hyderabad. Sandalwood is one of the precious hardwoods in the world. It is used in pharmaceuticals, fragrances, and also for spiritual needs. Narkatpally has the connectivity advantage from almost all the major towns and cities in the surroundings. Investing in land is always the best option to secure the money. Nowadays many people are showing interest to buy plots rather than flats or houses. If you wish to buy a plot and get good returns in the future then it is better to do plantation rather than building a house. 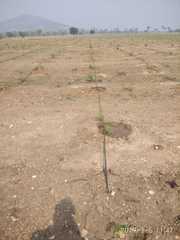 Sandalwood plantation will be the best beneficial investment. Want to own a residential property in the greater Hyderabad city? Don’t miss this Opportunity!! Open villa plots for sale in Thumkunta. It is one of the top investment destinations in Hyderabad. Thumkunta is a cool suburban town located in the northern outskirts of Hyderabad. It houses reputed colleges like Bits Pilani University and Nalsar University. In Hyderabad, investing in plots is the best option rather than flats. This is for a reason that one can expect for huge returns in the future with the investment in plots. Based on this factor, the demand for plots has been increasing a lot, especially in the outskirt regions. Thumkunta is one of the regions in the outskirt that is provided with excellent civic amenities and excellent connectivity with other parts of the city. Aryavartha Nagari is an excellent venture inside Outer Ring Road, at Thumkunta, Hyderabad. The venture is a combination of old-fashioned Indian architecture and modern comforts & luxuries. You can experience the life with an elegant mixture of lifestyle. It is an HMDA approved layout with 100% Vaastu compliance. Maheswaram is one of the fast developing suburban towns in Hyderabad. The availability of land spaces and its proximity to the other locations made it as an attractive destination. The government of Telangana is also paying attention to the development of the region. This area is a house to a number of schools, colleges, banks, ATMs, shopping malls, parks, etc. DTCP Approved Layout Plots is a sprawling luxury enclave of magnificent Plots near Shadnagar, elevating thecontemporary lifestyle. The venture at shadnagar connecting to kishan nagar in growth corridor, all development like black topped roads, street lights, electricity, drainages, footpaths, parks, compoundwall, entire layout security, clear title and visit immediately. Owning a property in a premium location with the best amenities and affordable price will make you lead a pleasant life. Maheswaram is a cool sub-urban town which is away from the busy city life and close to the RGI airport. It is located in the outskirts of Hyderabad and very near to the Outer ring road and Wonderla. 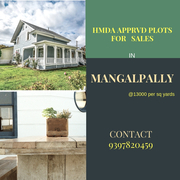 HMDA APPRVD PLOTS FOR SALES IN MANGALPALLY, HYD, INDIA. HMDA APPROVED PLOTS in MANGALPALLY Near KONGAR KALAN Close to Ibrahimpatnam Road & Sagar Highway. Opp – Adibatla Road. 50% Bank loans are also available... Its all about Futuristic Investment where already some IT companies are running and some other are in pipeline. IT Hub and other developments are within 10Kms radius from Site. Peram’s group presenting you a most prestigious project “Aditya Pride” in Maheswaram, Hyderabad. Maheswaram is a cool sub-urban town located in the outskirts of the city. This project is providing you residential plots for sale at an affordable price. By making your investment in this project you can enjoy world-class amenities which includes basic public amenities. India ads for Land for sale, Andhra Pradesh, Land for sale free ads Andhra Pradesh, Land for sale for sale Andhra Pradesh, Land for sale to buy in Andhra Pradesh. This page is a classified ads listing for Land for sale Andhra Pradesh. This listing includes classifieds for sale and to buy in Andhra Pradesh. If you posted an advertisement on Land for sale, Andhra Pradesh before please use Edit my ads button to change or cancel your ad. Land for sale Andhra Pradesh ads Andhra Pradesh, Land for sale classifieds Andhra Pradesh, Land for sale free ads Andhra Pradesh, ads for sale Andhra Pradesh, ads to buy Andhra Pradesh, FREEADS in India. Find here ads for sale, to buy and rent in Andhra Pradesh. Goods for sale in Andhra Pradesh, vehicles for sale in Andhra Pradesh, Andhra Pradesh real estate for sale, Andhra Pradesh property for sale, property for rent in Andhra Pradesh, business ads in Andhra Pradesh, Andhra Pradesh business classifieds, services in Andhra Pradesh, Andhra Pradesh services ads, jobs in Andhra Pradesh, pets for sale in Andhra Pradesh, Andhra Pradesh dating, Andhra Pradesh cars for sale.